It has been known for decades that rattlesnakes, boas and pythons have so-called pit organs between the eye and the nostril that can sense even tiny amounts of infrared radiation -- heat -- in their surroundings. Among pit vipers, the western diamondback rattlesnake, native to northern Mexico and southwestern United States, is in a class of its own, its heat-seeking ability up to 10 times keener than any of its cousins. Even with tiny patches covering its eyes, the snake has shown the ability to track and kill prey blindfolded. But exactly how these reptiles detect and convert infrared signals into nerve impulses has remained a mystery, and the subject of sharp debate. One candidate was the photochemical process underlying vision, whereby the eye sees electromagnetic radiation -- visible light for humans -- in the form of photons that activate receptor cells, which in turn convert the energy into a biochemical signal to the brain. Some fish, for example, can see into the infrared wavelength of the electromagnetic spectrum. But David Julius, a molecular biologist at the University of California in San Francisco, demonstrated in laboratory experiments that a different neurological pathway was at work for the serpentine "sixth sense." "In this case, the infrared radiation is actually detected inside the pit organ as heat," Julius said in a phone interview. "We found the molecule responsible." A very thin membrane inside the pit organ -- essentially a hollow, bony cavity -- warms up as the radiation enters through an opening in the skin, he explained. Because the membrane is in a hollow space, it is exquisitely sensitive to changes in temperature. "The heated tissue then imparts a signal to nerve fibres to activate the receptors we have identified," known as TRPA1 channels. 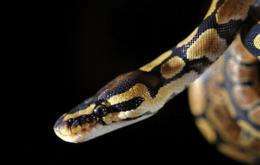 The neurochemical pathway involved suggests that snakes feel heat rather than see it. "The molecule we found belongs to a family of receptors related to pain pathways in mammals," Julius said. In humans, the equivalent mechanism is called the "wasabi receptor" because it allows our sensory nervous system to detect irritants -- such as the Japanese condiment -- that belong to the mustard family. It is not, however, activated by heat. The discovery, published in Nature, may also shed light on how snakes, which have been slithering across the planet for more than 100 million years, evolved. "Studying change in sensory molecules is an interesting way to look at evolution because as animals inhabit different niches, smell and taste different things, hunt different animals, their sensory systems have to adapt," Julius said. The findings also suggest that the forces of natural selection yielded the same remarkable heat-seeking mechanism in reptiles on separate occasions. Unlike boas and pythons, which also have pit organs, vipers -- including rattlesnakes -- are relatively recent arrivals, in evolutionary terms, and thus must have developed the same capacity independently. "It is amazing to think that random mutation could have come up with the same kind of solution more than once," Julius said. Burmese pythons slithering their way north?